Plot: A thousand years after the alien Gauna destroyed the Earth, a small remnant of humanity still fights on to survive, fleeing on the gargantuan asteroid-based spaceship Sidonia. But centuries of flight and warfare have changed mankind in incredible ways: Genetic engineering has allowed humans to photosynthesize like plants, reproduction occurs through cloning, and a third gender has been created to balance the population. And, even though it’s been a century since the last encounter with the Gauna, military service is mandatory, with all those able enough enlisted to pilot the Garde robots that stand as Sidonia’s front line of defense. For Nagate Tanikaze, whose grandfather secretly hid him in the forgotten bowels of the asteroid, it’s a strange new world as he’s forced to come to the surface and join the ranks of defenders. Yet his recruitment comes just in time, for the Gauna have suddenly reappeared, and what could be man’s last battle will require every resource humanity has left. And what no one knows, yet, is that Nagate is not exactly what he seems, and a secret buried in his past may change the fate of all mankind in KNIGHTS OF SIDONIA! 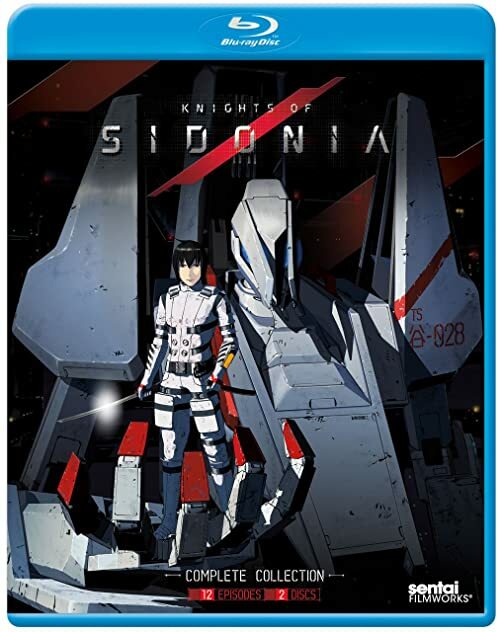 Animatsu Entertainment have released Knights of Sidonia – Season 1 onto DVD and Blu-ray within the UK; and the disc contents are exactly the same as this US release.